Last minute engine run-up and checks are performed on Habu 972 at Det 1, Kadena Airbase in Okinawa, Japan, prior to an operational reconnaissance sortie over the USSR’s naval port at Vladivostok. For over 21 years, Lockheed’s famed SR-71 Blackbird flew highly-classified missions all over the globe, gaining fame as the world’s fastest and highest flying aircraft. The painting Outrun the Thunder was completed in 2003, and was first featured during a reunion of SR-71 veterans. 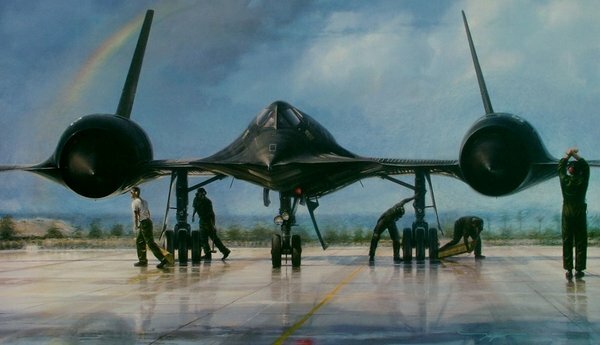 The back of the original oil painting and edition of lithographs was signed by an unprecedented 60 to 70-plus pilots and RSOs (Reconnaissance Systems Officers), representing approximately two-thirds of all the crews who ever flew the Blackbird during its operational career.